The Eppendorf Centrifuge 5430 delivers a bench space saving compact foot print, and the flexible use of a larger model to meet a wide variety of laboratory needs. This microcentrifuge work horse is compatible with a robust selection of rotors including accommodating aerosol-tight quick lock rotors that can hold 1.5/2.0mL tubes, 13/16/26/29mm round-bottom tubes, 15/50mL conical tubes, PCR tube strips, and microplates. In addition, the high speeds of the microprocessor controlled 5430 centrifuge is enhanced with speedy acceleration and deceleration times, a timer function, and storage of up to 50 user defined programs. Users can also set 5 quick buttons for frequently used protocols. The Eppendorf 5430 also features automatic recognition of rotor with speed limitation, and automatic detection of rotor imbalance. The low access height of this benchtop micro centrifuge makes loading and unloading of samples quick and painless, and the soft brake feature helps to protect more delicate samples after the completion of a run. 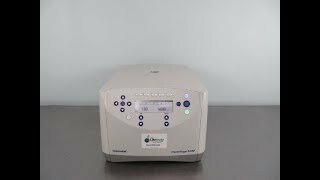 These Eppendorf 5430 Centrifuges have been fully inspected and are in great shape. All of our lab equipment comes backed with our standard warranty. Should you have any questions, please don't hesitate to contact us.